Founded in 1974, the Association for Neighborhood and Housing Development works to advance equitable, flourishing neighborhoods for all New Yorkers. A coalition of 100 community-based affordable housing and equitable economic development organizations in New York City, ANHD works at the nexus of organizing, policy, advocacy, and capacity-building. Their extensive network has built over 120,000 units of affordable housing by advocating for policy and research, training community organizers, and supporting the expansion of necessary funding. Low- and moderate-income communities and communities of color are disadvantaged by a multitude of housing and economic development policies. In response, ANHD's advocacy addresses a wide range of issues, including affordable housing, community development, land use, and equitable economic development. Their vision for an equitable city includes creating and fighting for just systems and policies that lead to economic opportunity and affordable homes for all New Yorkers. Recognizing that a neighborhood is more than just a place to live but rather a place to make a home, ANHD's anti-displacement approach includes an initiative to protect the City's vibrant small businesses. United for Small Business NYC(USBnyc) is a coalition of community organizations across New York City fighting to protect New York's small businesses and non-residential tenants from the threat of displacement, with particular focus on owner-operated, low-income, minority-run businesses that serve low-income and minority communities. Small businesses provide jobs, culturally relevant goods and services, and community, keeping our neighborhoods thriving and vibrant places to live. Under the threat of landlord harassment, impending displacement, and a lack of city resources, small businesses are now more vulnerable than ever. 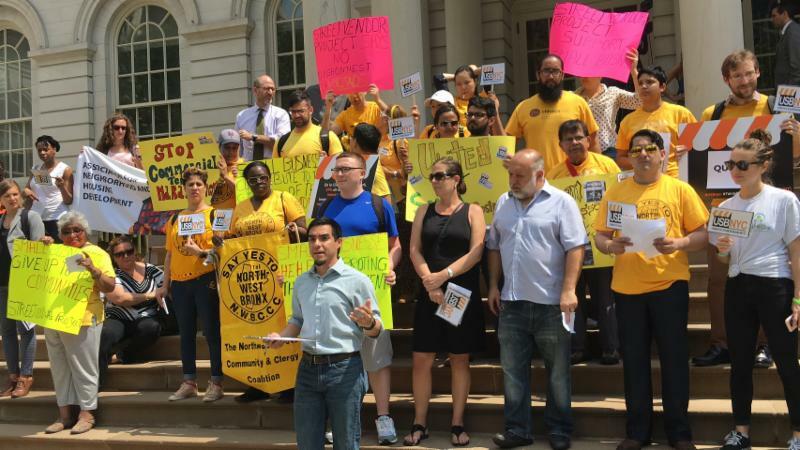 USBnyc aims to create strong, lasting protections for commercial tenants through mechanisms ranging from legislation that allows commercial tenants to litigate against unscrupulous landlords to City funding for small businesses to protections for immigrant communities. You can read the full USBnyc platform, which was made public at a rally on city hall steps earlier this month, here. Association for Neighborhood and Housing Development is among the organizations and individuals that we have assisted through our resource center. For more information on NPC, please see our website.